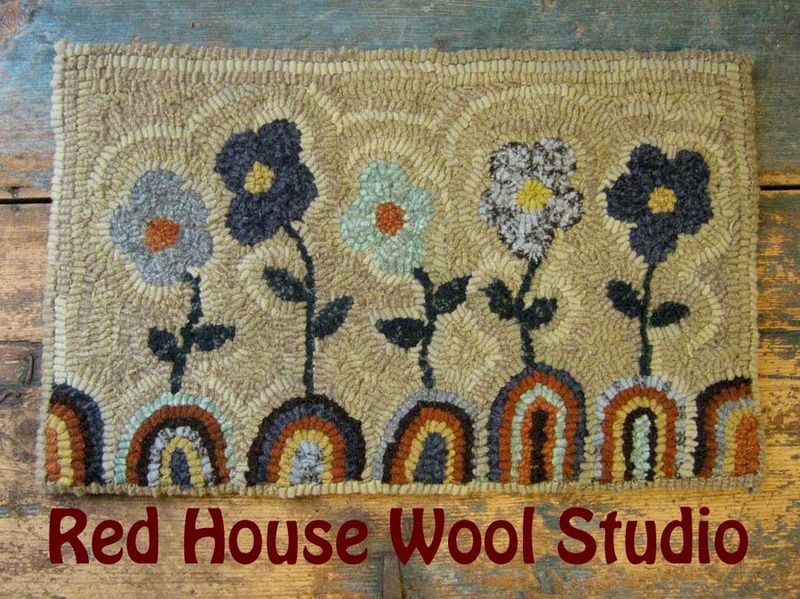 ORANGE SINK: September Hook-in at Red House Wool Studio! 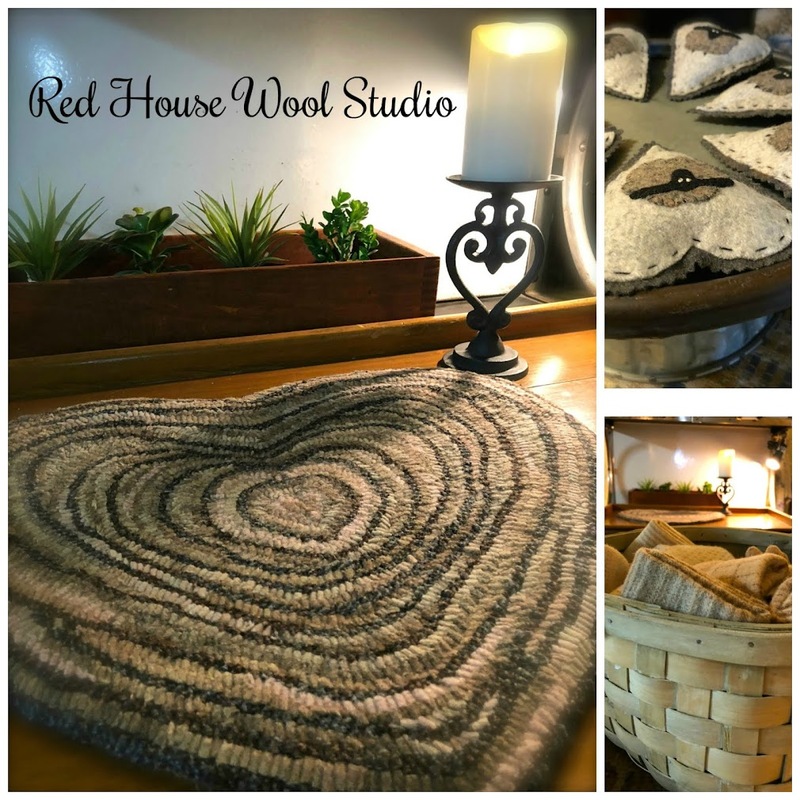 September Hook-in at Red House Wool Studio! We gathered here on this gorgeous day in northern Wisconsin to hook, stitch, a little show and tell and above all enjoy each other's friendship and company! 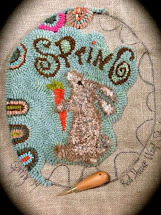 I hear it again and again how everyone looks so forward to our monthly hand-work gathering! 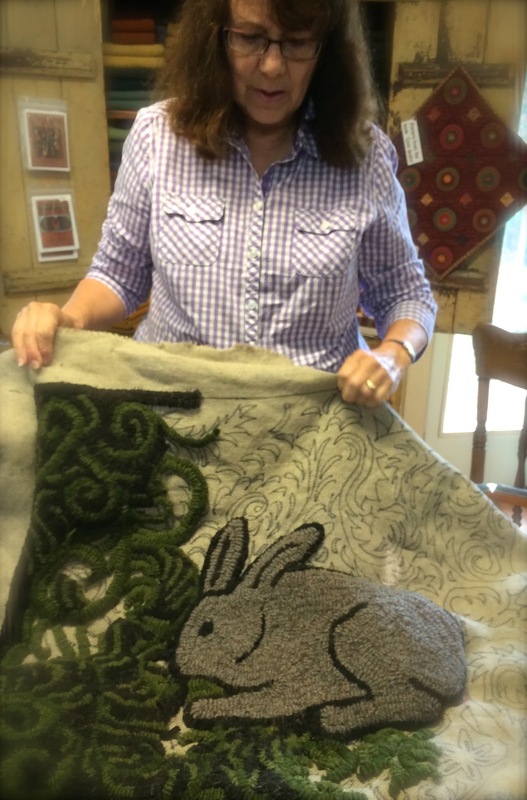 Shirley in the photo above, is working on her bunny rug with beautiful background! 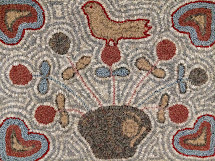 A Sharon Smith pattern. She's hooking in 8.5 and 9... wow! I love it! 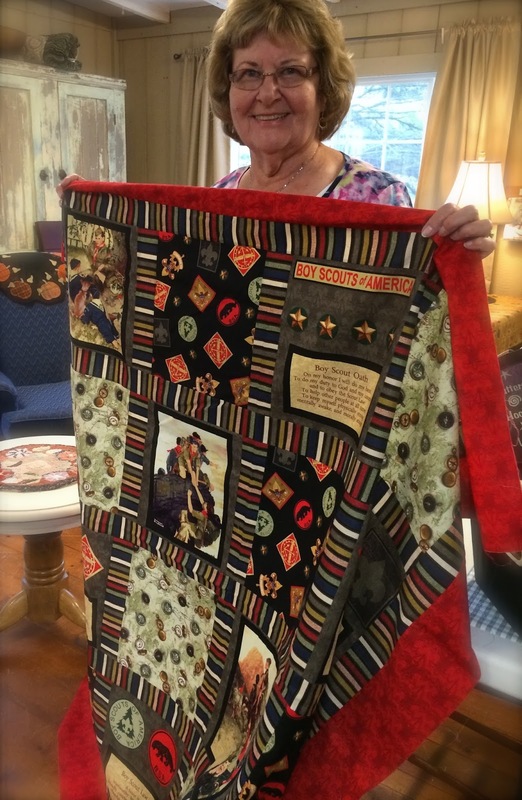 Saundra brought this quilt she is working on.... her grandson is an Eagle Scout and will soon be gifted with this quilt! Isn't it awesome! I am sure it will become a family heirloom! 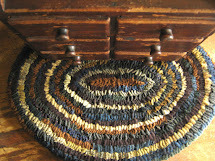 We love looking at all kinds of hand-work and are so grateful when someone brings their projects to share! 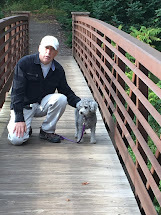 Betsy who will be heading south very soon ( yes, she's a lucky snowbird!) 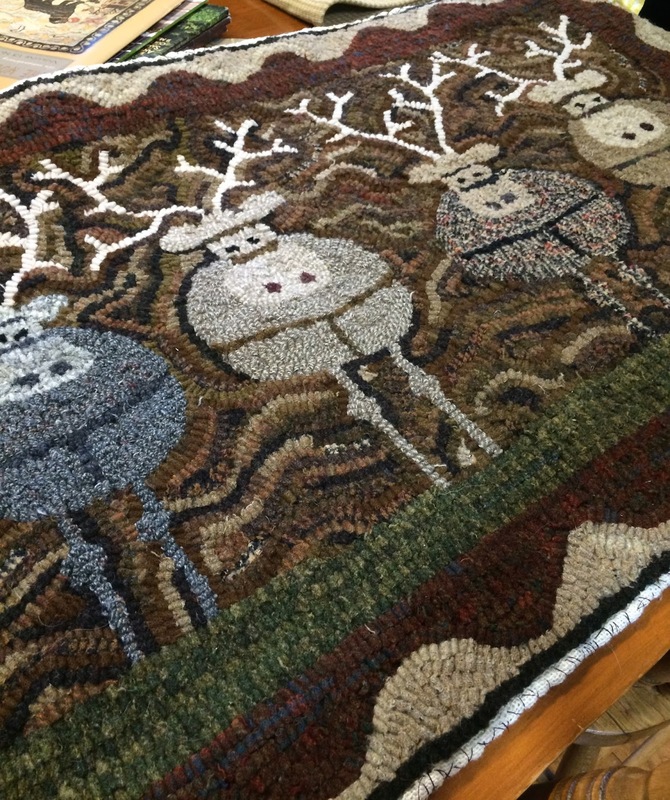 has finished hooking her reindeer rug(a Judy Cripps design-her website is Rustic Rugs) ..... oh it is wonderful!! 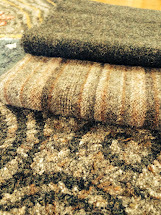 I love the wools in this rug so much! Maybe she'll accidentally forget it in front of my fireplace for the winter! LOL!! 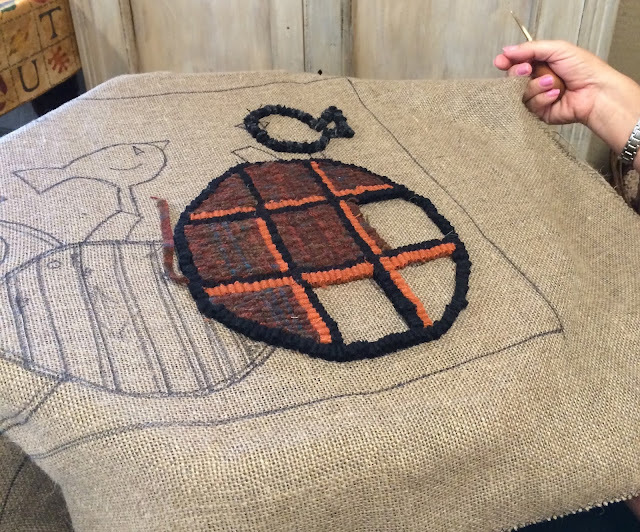 Betsy is just starting to hook my Autumn Trio pattern! I can see already that it is going to be full of Autumn glory! 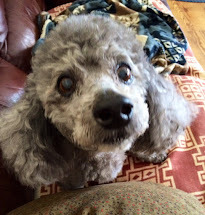 And sweet Nancy! 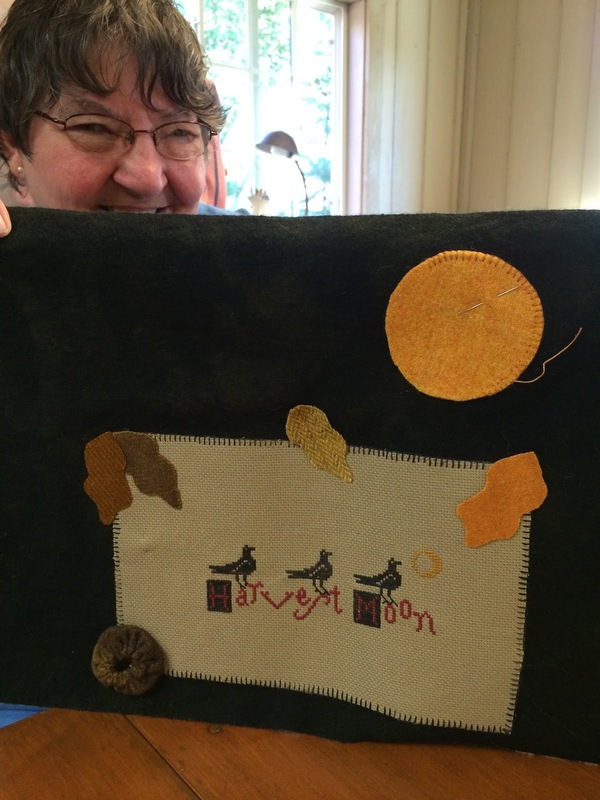 She is working on her stitchery with wool appliqué! I can't wait to see this one finished! 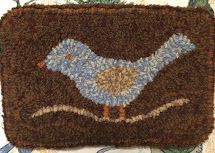 She does lovely hand-work and loves the primitive patterns! A girl after my own heart! Well.... it's been SO DARN busy around here! 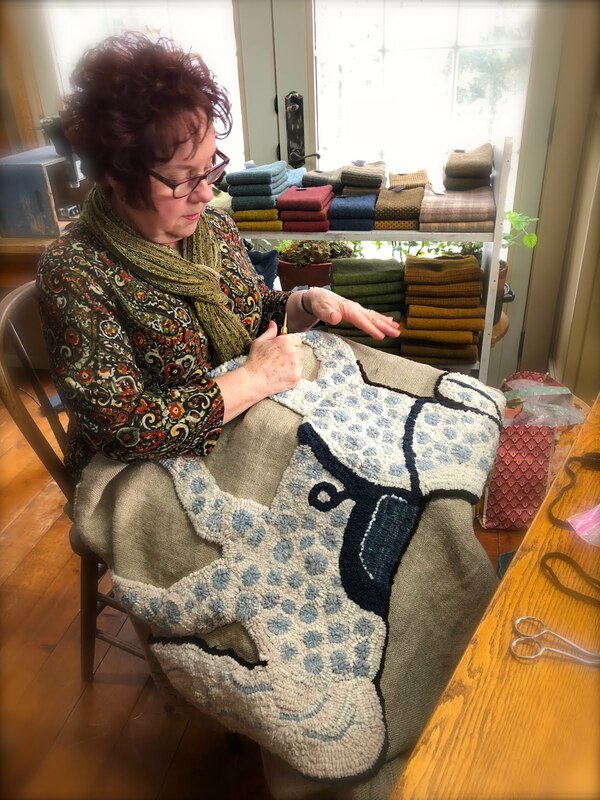 The wool is flying out the door and I am working like mad to keep things fresh with new models, colors of hand-dyed wool and inspiration for all to feast their eyes! If you are traveling this Fall and are near Rice Lake, WI and would like to visit the studio... email or call ahead as I would love to see you! 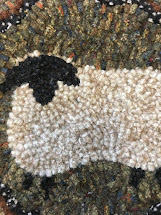 I carry plenty of wool, patterns and books, linen,Valdani threads and supplies for all your hooking and wool applique' needs! 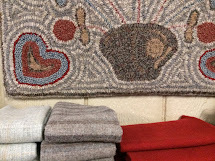 I am headed to the studio right now to unpack the latest shipment of wool! 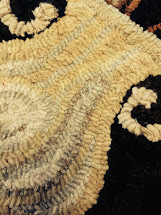 Maybe it will inspire a new pattern or two!! what a great gathering! Such great talent. I love that bunny rug the background is wonderful. what a wonderful day you all had! if I were closer I'd be there with you~ lovely hand work by all! That quilt is simply amazing!!!! Looks like you've got yourself quite a nice group of hookers!! I love seeing all the projects! I would love to be there once a month!! I love all of those designs!! What a wonderful group and so talented. It sounds like you have a fun time in store. 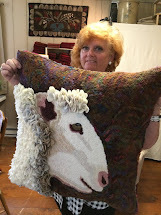 Anything with wool in it is just plain ole fun. It's was a fun day, gabbing, hooking, eating how could it be better. Thanks for including me this summer and I'll see everyone next May. I'll follow all your fun on this site. So post those pictures. It was a pleasure having you here this summer Betsy! We are going to miss you this winter! Send us some warm weather in January!! Blessings and Hugs!! 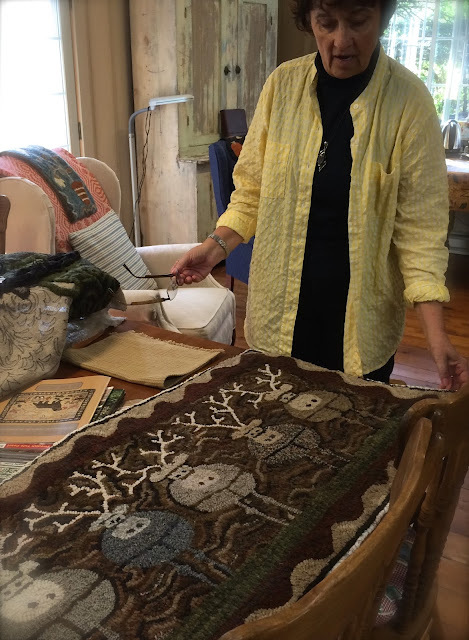 Cathy, your studio is simply wonderful...and looks like such a fun place to spend some time...and money! Wish I was close enough to come visit! Sorry I missed this month. 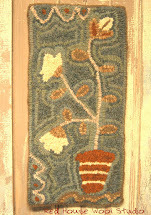 I finished my "Flower Pot". . . . see you next month!